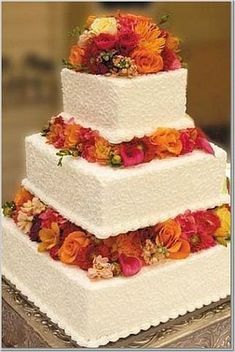 A great way to coordinate your wedding cake with the rest of the wedding theme is by using flowers on your cake. Here are 5 very easy and highly effective ways of placing flowers onto a wedding cake. This is when you or your florist arrange a small group of flowers that are the same colour and type as used in the bouquets. This can be done very quickly by arranging them into a small piece of oasis with a plastic base. 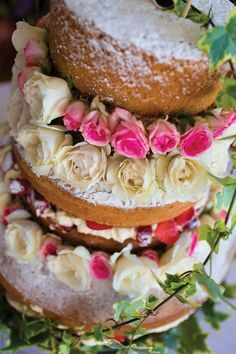 When roses are placed in-between each tier of the cake. The wedding cake is constructed on thin pillars and tiered with a gap of approximately 1 ¼ inches between each tier. Your florist or yourself can then easily place roses cut and taped to about 2 inches in length into the gap. You must ensure that the roses are tightly packed and lay flush with the cake so that you don't have any gaps showing. A flowing line of flowers that trail down the cake. This method is best suited to cakes that are tiered directly on top of each other. You start by individually wiring your chosen flower heads. Group several heads together, tape and secure on the top of the cake by gently pushing the taped wire stems into the cake. Then work your way down the cake pushing flower heads in at regular intervals. To create a strong band place the flower heads closely together. If you have a gap in-between your cake tiers and a flower arrangement on each tier you can easily link them together. Simply take a few stems of steelgrass and use it to link each of the flower arrangements to each other. If you have no room to place flowers onto your cake or if you are having individual cupcakes. Scattering rose petals around the base of the wedding cake is a wonderful way to link in your colour theme. Individual flower heads look very pretty when placed in-between cupcakes on a tiered cake stand. Don't forget some flowers and foliages are not suitable to use on cakes as they are poisonous. Ivy is one of those. If you're in doubt ask for advice from your florist or cake maker.